You know that good communication is the cornerstone of a healthy relationship. You and your loved one joke, share little moments, and talk about anything and everything. But what happens when communication breaks down? If you’ve been feeling like your loved one is distant, or isn’t communicating as well as they used to, they might be struggling to hear. Encourage them to take a hearing test and get back to communicating. For anyone in a stable relationship, you know things aren’t always smooth sailing. You have different opinions, and don’t always see eye to eye. Even the strongest couple can have disagreements that lead to heated arguments. But if your loved one has hearing loss, your relationship is about to get a lot more complicated. When your partner has hearing loss, you find yourself repeating the same thing over and over. This leads to frustration for both of you, and communication starts to break down. When it’s easier not to say anything at all rather than fight to be understood, you know you have a problem. As your loved one is struggling just to make out the words, they’ll often miss the meaning of what you’re trying to say and respond with a blank look rather than smile over a shared joke. Not only that, but your loved one will start to rely on you for help with simple tasks like ordering a coffee or answering the phone, putting even more strain on your relationship. Not only will your relationship suffer, but all your loved one’s friendships will weaken. Your loved one may choose to stay home rather than meet friends for dinner. The restaurant is always noisy, and they can’t hear what’s being said. They may be embarrassed to answer inappropriately and isolate themselves rather than struggle to understand. Those living with untreated hearing loss risk far more than broken relationships. Hearing loss is a risk factor for cognitive impairments, like faulty memory and difficulty concentrating. Not only that, but those with hearing loss have a far higher chance of developing dementia or Alzheimer’s. 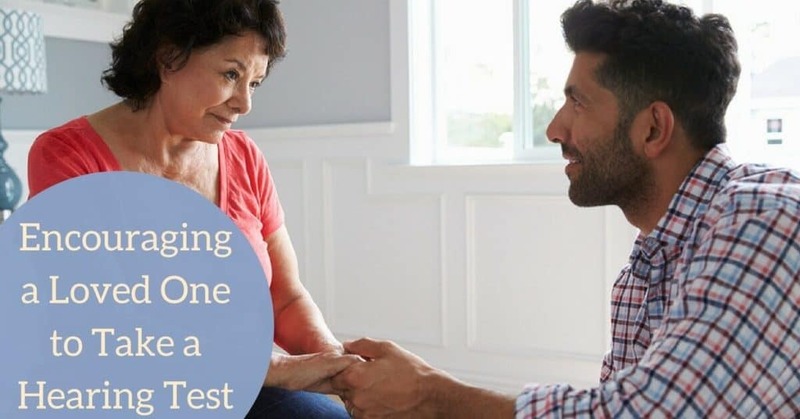 One of the best things you can do to help your loved one stay sharp as a tack is to encourage them to get a hearing test and seek treatment for their hearing loss. It can be difficult to talk to your loved one about their hearing loss. They might not be ready to admit that they’re struggling to hear. Many people think admitting they have hearing loss is a sign that they’re getting older, and they don’t realize that hearing loss affects millions of Americans of all ages. Your loved one might deny they have a problem or blame others for mumbling or not speaking loudly enough. Talking to your loved one about their hearing loss can be hard. Before you have that first conversation, make sure you’re armed with all the facts. Has your loved one been turning up the volume on the TV? Did they miss the phone ringing again this afternoon? Do they struggle to hear in places with a lot of background noise, or always ask you to repeat yourself? These are common signs of hearing loss, and your loved one won’t be able to deny the facts. After you’ve had a conversation about hearing loss and your loved one is ready for a hearing test, call us at Paragon Hearing to book a free hearing assessment, and offer to accompany your loved one. Hearing tests are easy and completely non-invasive. We’ll take a history of your hearing health and do a physical exam to check your ears for injury, or a build-up of wax, dirt, or dust. Encouraging your loved one to visit Paragon Hearing for a free hearing test will have a positive impact on your relationship. You can get back to easy communication and sharing all the little moments that make life so special.